Halloween searches are some of our favorite trends to look at all year. Using Insights for Search and some internal data, we took a peek at which costumes and candies are on top in the United States. This year seems to be about the battle of the birds. Searches for [angry birds costume], based on the game phenomenon that has so many of us addicted, have been steadily rising in 2011, and we’re seeing 10 times more search volume this year than last. But as of mid-October, the Angry Birds were overtaken in search by [black swan costume]. The Darren Aronofsky ballet drama seems poised to be the most popular costume idea by All Hallows Eve, with related searches for everything from [black tutu] to [black corset]. Some are even looking to be the alter ego [white swan]. Meanwhile, search data doesn’t seem to show that anyone is too anxious to be the object of the Angry Birds’ rage—at least not independently from their sworn enemies. 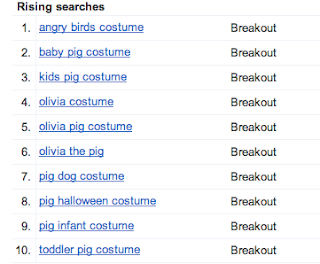 Although [angry birds costume] is one of the top 10 fastest-rising searches related to [pig costume] over the last 90 days, another three are focused on a much sweeter piglet, the cartoon favorite Olivia. Birds aside, this year’s fastest rising costumes in the U.S. overall are inspired by a variety of sources from pop culture over the past year, including TV shows—[pan am], [wilfred]—movies—[smurfette], [tron], [captain america]—pop music—[nicki minaj]—and more [monster high]. Even if you don’t want dress up as a YouTube star, YouTube can still help you create your Halloween costume. Head on over to the YouTube Blog for video tutorials and other inspiration. Lest you think Halloween is just for humans, take a look at the huge amount of searches for [dog costume]. In terms of get-ups actually intended for canines, ewoks and dinosaurs are the fastest-rising related searches. 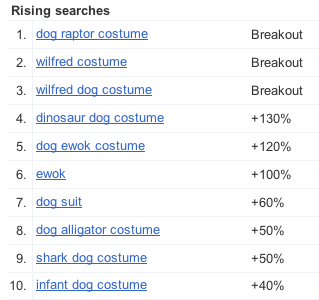 But two of the top five rising searches in 2011 related to [dog costume] are a little quirkier: at least a few people out there may dress up as the eponymous character from FX’s “Wilfred” show, about a dog, and a man who sees the dog as a man dressed in a dog suit. Kinda meta. Turning from costumes to the other traditions of this holiday, searches for [haunted house] and [pumpkin patch] are both spiking right now, but there seems to be greater interest in spooky thrills than in finding that perfect pumpkin to carve. Maybe spiderwebs and peeled-grape eyeballs are a less scary proposition than running into the [great pumpkin] (from the classic movie which, incidentally, celebrates its 45th birthday this Halloween). When trick or treating, there’s always that one house that insists on making Halloween healthy—but luckily for us, those are few and far between. Over the last 30 days, there is almost two and a half times more search volume for [candy] than for [apples]. The classic game of bobbing for apples, however, it still going strong, spiking dependably every October. Whether you’re dressing up as an elegant avian ballerina or a brightly-colored roly-poly bird in a slingshot, we hope you have a spootakular Halloween! Let’s take a look at some Halloween searches.